Thyroid hormone replacement has been used for more than a century to treat hypothyroidism. Natural thyroid preparations (thyroid extract, desiccated thyroid, or thyroglobulin), which con- tain both thyroxine (T4) and triiodothyronine (T3), were the first pharmacologic treatments available and dominated the market for the better part of the 20th century. Dosages were adjusted to resolve symptoms and to normalize the basal metabolic rate and/or serum protein-bound iodine level, but thyrotoxic adverse effects were not uncommon. Two major developments in the 1970s led to a transition in clinical practice: 1) The development of the serum thyroid-stimulating hormone (TSH) radioimmunoas- say led to the discovery that many patients were overtreated, resulting in a dramatic reduction in thyroid hormone replace- ment dosage, and 2) the identification of peripheral deiodinase- mediated T4-to-T3 conversion provided a physiologic means to justify L-thyroxine monotherapy, obviating concerns about inconsistencies with desiccated thyroid. Thereafter, L-thyroxine mono- therapy at doses to normalize the serum TSH became the stan- dard of care. Since then, a subgroup of thyroid hormone–treated patients with residual symptoms of hypothyroidism despite nor- malization of the serum TSH has been identified. This has brought into question the inability of L-thyroxine monotherapy to universally normalize serum T3 levels. New research suggests mechanisms for the inadequacies of L-thyroxine monotherapy and highlights the possible role for personalized medicine based on deiodinase polymorphisms. Understanding the histor- ical events that affected clinical practice trends provides invalu- able insight into formulation of an approach to help all patients achieve clinical and biochemical euthyroidism. 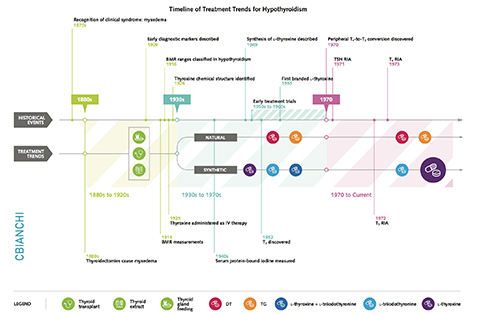 The History and Future of Treatment of Hypothyroidism.